Despite compassion and commitment, caring for others can be distressing and take a toll on your body, mind and spirit. In this 1-hour audio-book, you’ll find a wealth of insightful, sensible and comforting self-care strategies to help you care for yourself as you care for others. • Personal stories of one daughter’s journey through her mother’s Alzheimer’s disease. • Professional resilience-building recommendations from a psychiatric nurse. 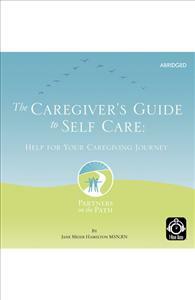 • Practical, user-friendly advice on how to manage caregiver stress. • Questions to guide your personal reflection or discussions with others. To enrich your audio-book experience, the author offers free, downloadable chapter summaries and checklists, a questionnaire and list of resources.